Formerly a problem front yard, I removed all the grass, enlarged the beds, and created a series of ponds and waterfalls on an "unusable" hill. What is the gracc planted in front of the coleus? Thank you. Hi. That is blue dune lyme grass. It's one of my favorites for its color and texture. In certain parts of the country it can be pretty aggressive, so planting it will depend on your conditions as well as your tolerance for occasionally keeping it in check. It doesn't spread as aggressively for us in my area, I think because of our clay soil. Thanks for the question. No question, just a comment: - Your work here is stunning. Exceptionable! Thanks for sharing. Todd, thank you very much for the compliment. I'm glad you appreciate my hard work. Happy gardening to you. 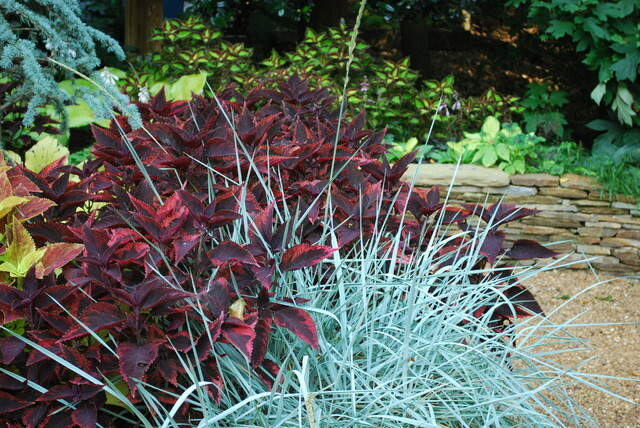 Red Coleus and a blue grass of some sort, GREAT combo, could work in my Round Rock garden!